Buying a used heavy-duty truck can make sense for a growing business or for people who need to haul heavy items for personal use. Heavy truck salvage bought through an online auction, which might include repo trucks for sale, is an alternative to buying through traditional means. Armed with your budget and with a good idea of the type of heavy truck you want, be it a cherry picker, moving truck or refrigerated truck, here are some things to consider when buying heavy-duty trucks. Choose a cut-off year for the make and model of truck you are looking for at auction. Heavy truck salvage from the ’70s or ’80s might require more repair than you can handle. Always look for heavy-duty trucks that have been well-maintained. Every vehicle has a history of inspections and maintenance reports attached to its VIN. Armed with this history, you will want to inspect the vehicle yourself or have a trained mechanic do it for you. Repo trucks for sale might have some problems, but they might be easily repaired. With diesel and gasoline prices continuing to rise, purchasing a fuel-efficient heavy truck is important. Great fuel economy and mileage can have a huge impact on your bottom line through reduced operating costs. The U.S. government and several other sources provide online rankings and ratings of heavy-duty trucks to help you make your decision. During an inspection of the truck, you will want to check the parts that were used to repair major components such as the engine as well as minor parts such as the seats, mirrors and lights. 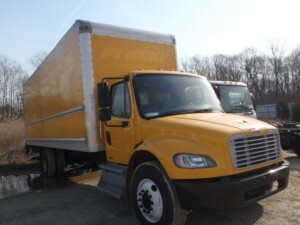 With top names such as International, Sterling, Freightliner, Ford, Peterbilt, Kenworth, Mack, Volvo, Hino and GMC available at SalvageTrucksAuction.com, you will be able to find the quality heavy-duty truck you need.